Samajwadi Party candidate Azam Khan, caught on camera making disgusting comments while railing against his BJP rival Jaya Prada in Uttar Pradesh’s Rampur constituency, said today that he will not contest the elections if anyone can prove that he named the actor-turned-politician when he said , “…the underwear beneath is of the khakhi colour.” A First Information Report or FIR has been filed against him in Rampur for “insulting” the modesty of a woman. “I will not contest the polls if proven guilty…I haven’t named or insulted anyone and I know what I should say,” Azam Khan told news agency ANI on the crude remarks at an election rally on Sunday. “I was a nine-time MLA from Rampur and have been a minister. I know what to say,” the SP leader said in a retreat following outrage and condemnation of his comments. The SP leader had said on Sunday, “…I want to ask you, should politics stoop so low? 10 years the person sucked the blood of Rampur , I held that person’s finger and brought the person to Rampur. I made her familiar with the streets of Rampur . I didn’t let anyone touch her. No dirty words were used. You made the person your representative for 10 years . But what is the difference between you and me. Rampur waalon , Hindustan waalon , uski asliyat samajhne main aapko 17 baras lag gaye (understanding the person’s real face you took 17 years). 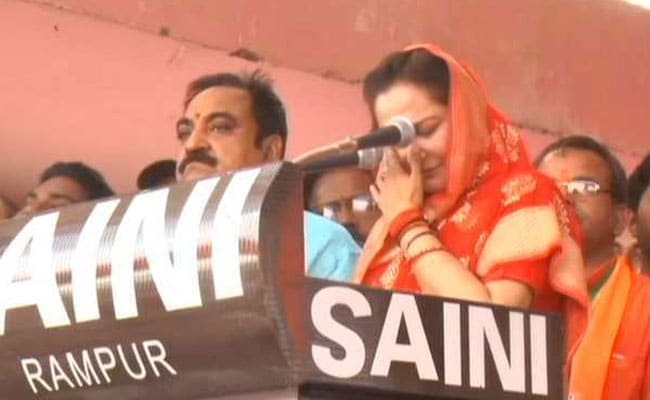 I realised in 17 days, that the underwear beneath is of the khakhi colour.” Azam Khan’s remarks were widely interpreted as targeted at Jaya Prada, who last week alleged that she left Rampur after her “indecent images” were circulated and attempts were made to attack her with acid. The BJP and its ally Janata Dal United strongly criticised Azam Khan’s remarks. “This type of language is unacceptable…using such words for women is shameful, we condemn this statement. Azam Khan should apologize,” demanded senior JD(U) leader Pawan Verma.